You will always know what to say, how to say it, and how to communicate with CONFIDENCE so you get more good leads and clients. 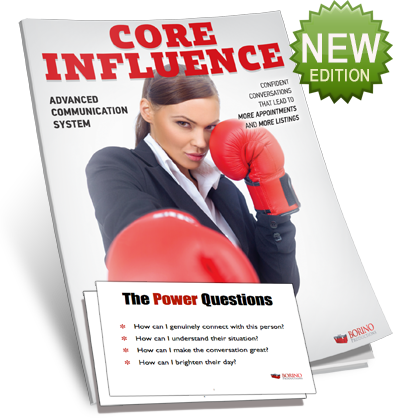 Over 60 new scripts, no pressure dialogs, core questions, and objection handlers -- all using advanced influence, power language and psychological triggers. From opening dialogs, icebreakers, to follow-up conversations that lead to appointments. How to have 20-30 motivated visitors at your next open house. Tools, strategies, and systems to generate good buyer and SELLER leads that come to YOU. Without a big budget or a big listing inventory. Easy to follow video tutorials, real life examples, effective dialogs, copy & paste marketing materials, and more. Feeling lack of discipline or focus? Not enough motivation? 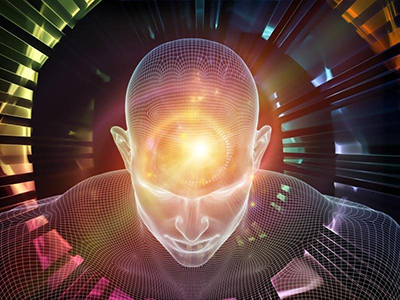 This real estate-specific audio program will remove your subconscious roadblocks and install more discipline, sense of success, inspiration, focus and high self-esteem. Just listen to one of the five audio tracks before you go to sleep. 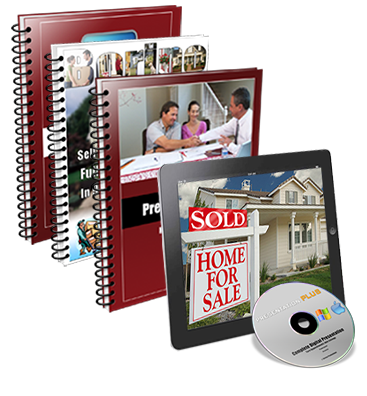 Advanced communication and marketing real estate course. How to stop 'chasing' the business, and have leads and clients come to YOU. How to get buyers' and sellers' attention in a crowded, competitive area. Strong "under the radar" influence and pull techniques that draw business to you, using direct mail, email, video, online and off line promotions, as well as communication on the phone and in person. Includes a video course and dozens of real life marketing examples. 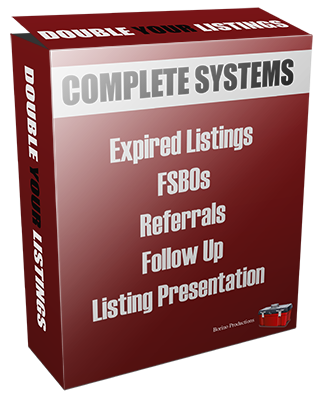 Complete system to turn expireds into great leads, appointments, and saleable listings quickly. Without being pushy or aggressive. And without much experience. 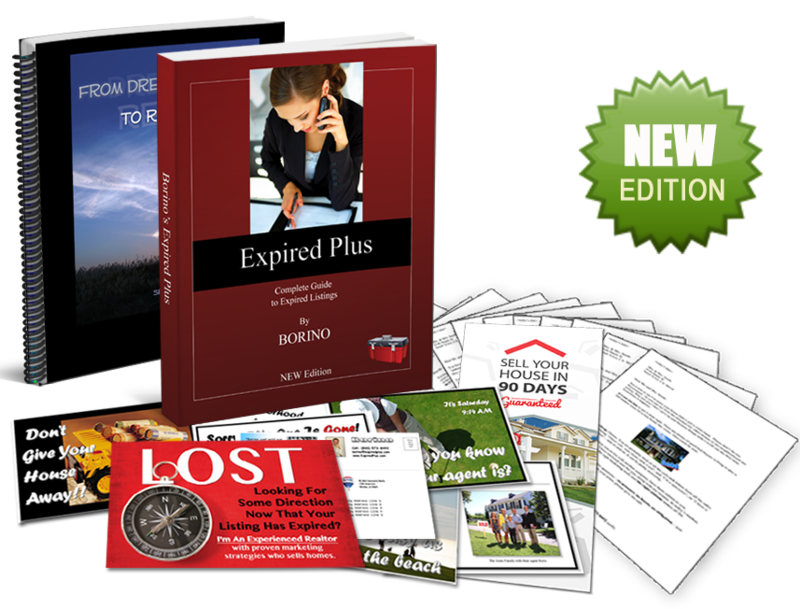 The package includes step-by-step instructions, complete library of letters and mailings, an expired brochure and resume, full follow-up sequence, a set of "no pressure" friendly dialogs, and much more. Complete system that turns even the toughest, most difficult FSBOs into friendly clients, great listings... and nice commissions. 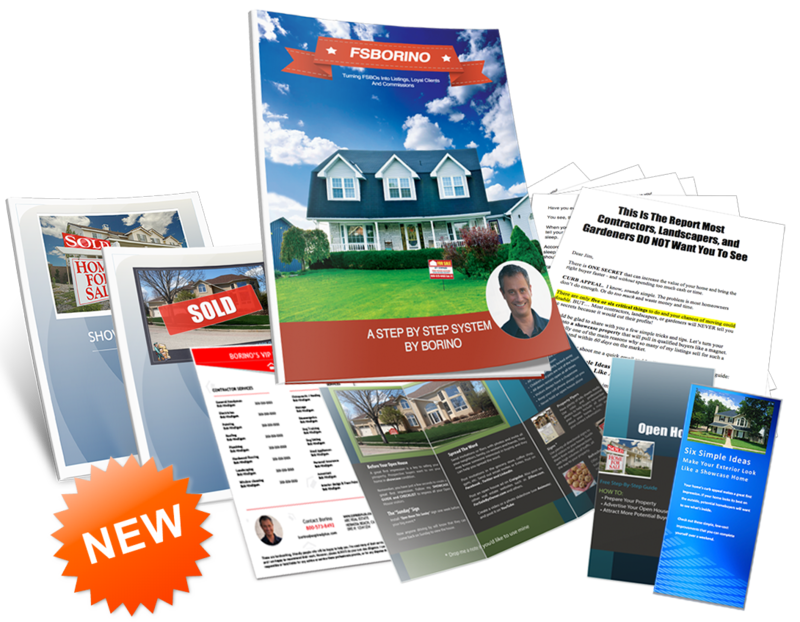 Includes a step-by-step guide, FSBO marketing library, 10-part video course with real life examples, FSBO Objection Crusher... And a private implementation session with Borino. 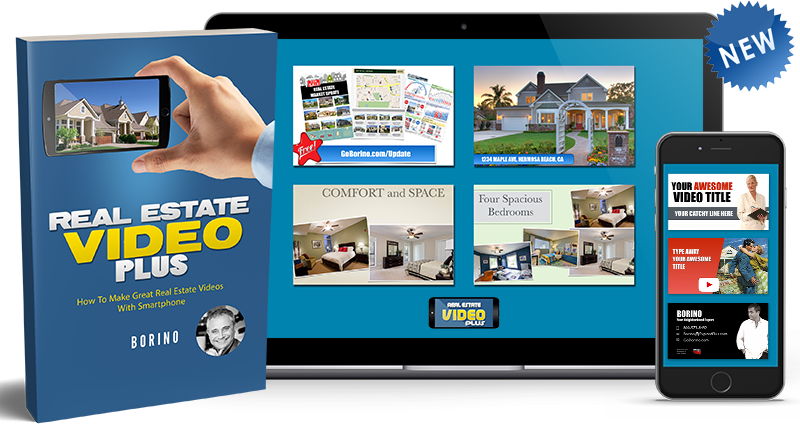 Learn how to make great real estate videos that attract new leads and clients -- with nothing but your smartphone. Instant access to over 40 video lessons, walk-throughs, scripts, and examples. Over 100 pages of checklists, tips, notes, and outlines. 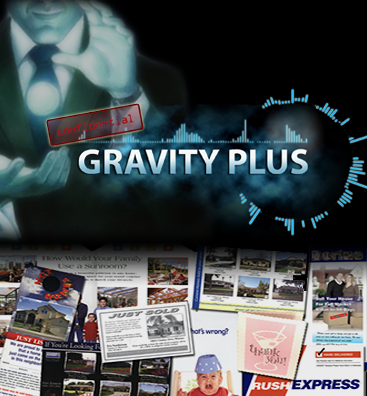 Plus a full library of professional music, sound effects and artwork to add professionalism to your videos. Yes, Borino, I want to upgrade to The Complete SUCCESS PLUS Package, get instant access to the entire system and jump-start my business immediately! I will be billed 4 easy monthly payments of $299. 6 new listings in last 30 days. All from expired listings! Keep doing what Borino says, it works! I started going to expireds using your system about 2 weeks ago now, and I have already signed on my first listing.